Walk away, however, is exactly what I did not do on the morning of May 21 – Lawson Cup final day. I arrived at Jackman Park, the home of Limerick junior football, expecting a fight. 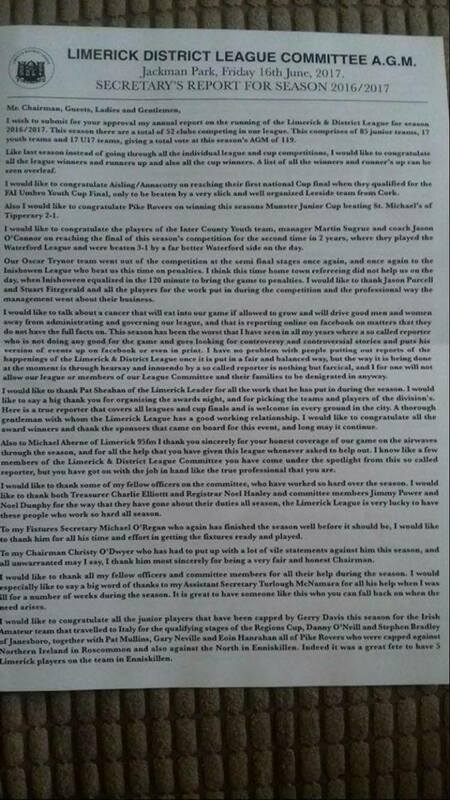 Three weeks earlier, I had published an investigative piece that caught LDLC chairman Christy O’Dwyer bang to rights for favouring his own club. Both he and fixtures secretary Michael O’Regan, whose misconduct I had written about the prior March, were waiting for me at the gate. Despite having no jurisdiction over me, a non-member of any affiliate club, council had laid down a decree that I was to be banned from Jackman Park. O’Regan and O’Dwyer were determined to enforce it. Amid cries of “slander”, both men attempted to physically bar me from entering the ground. While I loudly exhorted them to unhand me, and either accept my money or call in the actual authorities, matchgoers simply stood by and gawped. One woman, who had no idea who I was or what was happening, did attempt to intervene. But the vast majority who knew exactly what was playing out, and why, did nothing. One FAI employee, a regional development officer, even appeared to draw much mirth from the whole squalid scene. Again, those immortal words came to mind: no one cares. The officers eventually ceded ground, as weak men tend to do, and I was duly free to cover one final game of junior football. But further indignities were to follow. Then LDLC secretary Paul Neville, whose gross maladministration I also highlighted in March of that year, decided to dedicate half of his end of season report to telling stakeholders what a “cancer” I was. Few, if any, came to my defence publicly. And Neville, O’Regan and O’Dwyer were all comfortably re-elected at the June AGM – as always. All three men, along with most of their fellow committee members, had been in situ for many, many years. For there is no such thing as corporate governance, no such thing as a term limit, in the murky world of amateur football administration. All over the country, small groups of ageing males have turned their districts into fiefdoms, and woe betide anyone who attempts to derail the gravy train. For the officer class, the powers conveyed upon them by their posts act as handy sticks with which they can beat anyone who dares to think about stepping out of line. But, for the most part, apathy is all they need to cling onto their positions year after year. And there’s plenty of that to go around. Speaking on Sunday to RTÉ’s Brendan O’Connor, market analyst Paul Sommerville confessed to having little interest in the developing John Delaney story. In his words: “We’ve seen this so many times in Ireland. In two weeks we won’t be talking about this; he will move on.” Paul is no football expert, but it’s difficult to conclude that he’s wrong on this count. Delaney’s 14-year tenure as head honcho of the FAI is moribund, and long-serving 79-year-olds Eddie Murray and Michael Cody have already exited stage left. And it may well be the case that genuine corporate governance reform (reasonable term limits for board members, independent directors, etc.) will be imposed on the FAI in their wakes. But scalps like these have been claimed before; the rotten edifice atop which the FAI sits, however, always survives untouched. When the ‘Merriongate’ scandal earned John’s father Joe the bullet in 1996, nothing really changed – because another man of similar ilk was sitting in the chamber, ready to be fired at an unsuspecting Irish football public. Financial irregularities duly felled Bernard O’Byrne too, as they have now done for Delaney junior. Meanwhile, many of the men who sit in supposed judgement on the 58-strong senior council have seen them all come and go. Their number includes the NEFL’s Gerry Gorman, whose pathetically obsequious March 28 statement damned the “unscrupulous methods” of Delaney’s critics (he just about stopped short of calling them “cancers”, presumably). And, like Gorman, Kerry’s John O’Regan, who bitterly mourned Delaney’s imminent departure on national radio this past weekend, was also a member of senior council when ‘Merriongate’ reached its dramatic denouement. The FAI board, that only recently self-imposed eight-year term limits, does not have a monopoly on glacial turnover, you see. And, although the names on senior council may occasionally change, the local and regional pools from which they are mostly drawn are always stagnant. No surprise, then, that Delaney and friends have long overlooked the so-called “problem child” that is the League of Ireland. When those clubs make up only a third of senior council, a third of annual voting power, why bother paying attention? Far easier to curry favour with the proportionally stronger grassroots scene by assiduously lapping the chicken-and-chips circuit with bags of loot in tow. Charlie Haughey himself would be proud; for Charvet shirts, read Thomas Pink. Successive FAI panjandrums, therefore, have been positively incentivised to overlook the senior game in favour of its amateur equivalent. That is why we have the ‘Festival of Football’. That is why we have ‘John Delaney Park’ in Clones. That is why the annual winners of the SSE Airtricity Premier Division net under €100,000 in prize money after affiliation fees are taken into account. And that is also why a seemingly unending stream of local and regional administrators came out to bat for Delaney in recent weeks. These are the people he’s carefully cultivated over the years; these are the people the structure of the FAI has encouraged him to cultivate. Only a man of his arch political cunning could prosper in such an environment. Men of actual talent, insight and intellect need not apply. And, for the most part, they don’t apply. All over the country, Irish football has a problem attracting and retaining highly capable people with the skills to make a difference. Much like the George Lees and Justin Keatings of political days gone by, these individuals have ultimately found their expertise unwanted by a system that prioritises the hail-fellow-well-met, the cute hoor. As a result, they stay away. And the inept insiders, those with a vested interest in halting the progress and transparency that would expose their myriad deficiencies, do their best to keep them away, too – as I ultimately found to my detriment. Only those complicit in propping the whole rotten edifice up are kept under the tent. Just a couple of short weeks after my Jackman Park ordeal, at an awards ceremony concocted by the Limerick Leader’s junior football correspondent, the LDLC rewarded their host, and a Live 95 broadcaster, for their shared silence. A formal presentation was made to the pair, both of whom were also namechecked glowingly in Paul Neville’s aforementioned end of season report. Both men had sat soundless in response to the litany of wrongdoings I uncovered over the preceding months. But both men were not the problem, the “cancer” that will “eat into our game” if you will. I was. Not one bit surprised by that statement from the NEFL. As you can see, Gerry Gorman is a Delaney acolyte. It's safe to say he's not speaking for the clubs. Unfortunately, whether one wishes to walk the path of Irish media or that of Irish football, both honesty and integrity appear to be very much surplus to requirements these days. But, even more unfortunately, the public doesn’t seem to place any value on such qualities either. The most egregious example of this indifference I can think of centres on one particularly underhand LDLC officer who will rename nameless. Many years ago, this man was caught redhanded (on tape) threatening a former sexual partner with disadvantageous treatment from his place of employment if she did not continue to gratify his needs. Everyone in Limerick, both inside and outside of football, knows about this grubby business. And yet the same man continues to this day in a prominent community role, parading around in his LDLC blazer, glad-handing and shoulder-rubbing whenever and wherever possible – often emblazoned across the pages of local newspapers. So-called football people in Limerick let this happen; no one says a word; no one cares. Given recent events, I should be hopeful that such rank apathy is gone, never to return; but I’m not. History has shown me that, as Paul Sommerville suggests, normal service always resumes after the FAI plonks a few heads onto platters. By using the stick of state funding withdrawal, the Government and Sport Ireland may yet conspire to inflict genuine corporate governance reform on the association. But it’s imperative that both parties recognise that the association’s board is merely the apex of a putrid pyramid, the same pyramid up which John Delaney and many John Delaneys before him clambered. There are many more waiting in the wings, perched interminably on the lower tiers, engaging in the ancient art of arslikhan that will eventually see them granted permission to fly upward. There is, therefore, only one conclusion left to draw: any reforms imposed on the FAI board must also apply all the way down, to any and all affiliate arms of the association. The question is: does anyone care enough to make that happen? Bang on. Some home truths there.